During his pastorate in Nottingham, Maryland, he headed an academy renowned for its standards of scholarship. In recognition of his work, he was given an honorary degree by the University of Glasgow, making him the second American divine to receive an honorary degree abroad. 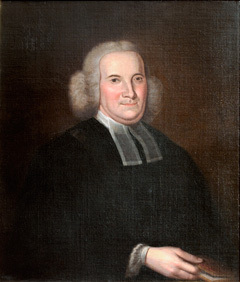 His interest in higher education led him to become one of the original trustees of the College of New Jersey; when he was elected its president in 1761, he was regarded as “a very accurate scholar, and a very great and good man.” Finley’s presidency was marked by steady growth in student enrollment. During his presidency, Finley planted two sycamore trees in front of the president’s house (now called Maclean House). According to Princeton legend, they were ordered by the trustees in 1765 and planted in 1766 to commemorate repeal of the Stamp Act. They still stand today. Attributed to John Hesselius, American, 1728-1778. Oil on canvas, 73.3 x 62.3 cm. (28 7/8 x 24 1/2 in.). Princeton University, gift of Mrs. Pauline Brock, wife of Mr. John Penn Brock.